Any Disney fan will know the feeling of the post-Disney blues only too well. As for us, it's a well-known condition. Symptoms usually start to show up just as you arrive home from another wonderful Disney vacation. You start getting back into your normal day-to-day life, but you just can't shake that feeling that this isn't enough. Then you realise what the problem is. You're missing being at the most magical place in the world, and want nothing more than to return there. However, with the current economic climate, your next visit may be many months, or even years away. We certainly know that feeling only too well. PassPorter Moms Podcast In-Sync Laugh! During a podcast about Disneyland with the Dads from the Disney Moms Panel, podcast hosts Jennifer and Sara laughed completely in-sync at one point. This is a screen shot of the sound waves of the laugh! Thought it was cool enough to capture so everyone could see it. We're very fortunate to regularly visit Disney parks around the world, although with Orlando a nine-and-a-half hour flight away from us, we very rarely get to Walt Disney World more than once a year. Our last visit there was back in April 2011, and we won’t make it back until December of this year. In fairness, we did manage two days at Disneyland in California, and the Disney cruise around Alaska in fall 2011, which helped to feed the Disney addiction, and we’ll have a day at Disneyland Paris in October, but that’s still almost a year without our Disney dosage. Because gaps like this are regular for us, I’ve become used to coping with it, and finding ways of managing those post-Disney blues. The most important thing is to keep your previous visit as alive as you can when you get home. So how do you do that? First, go through any photos you’ve taken and get them printed up. I always find looking back through photos helps remind me of what a wonderful time we had. Perhaps you opted for the Disney PhotoPass CD? In which case, that’s something else you can do when you get home. Perhaps if you fancy being creative, you can put together a photobook or a scrapbook. Again, that takes more time, and it helps to keep the memories alive. I personally love nothing more than compiling a scrapbook from our trip, and it usually takes months to complete, helping to keep the Disney magic alive. Another great way of keeping the trip alive is to write about it. PassPorter's message boards have a whole forum, Sharing the Adventure, dedicated to pre-, during-, and post-trip reports. I always write a trip report, and that helps me to relive our wonderful vacation. If you don’t fancy sharing your own experiences, then why not read about other’s plans and what they did at Disney? I love reading about people’s Disney’s trips, and with separate forums for trip reports on Disneyland California visits, and Disney cruises, there’s plenty to keep you occupied on the message boards. Listening to music can be another way of keeping the magic alive. You can have Disney music streamed to you online via Live 365, or perhaps you have some Disney CDs? I personally love nothing more than getting out our IllumiNations CD and playing that, even if it does reduce me to tears every time I hear it! It always takes me back to Epcot to some truly wonderful nights watching that show. If music isn’t your thing, then why not try listening to a podcast? 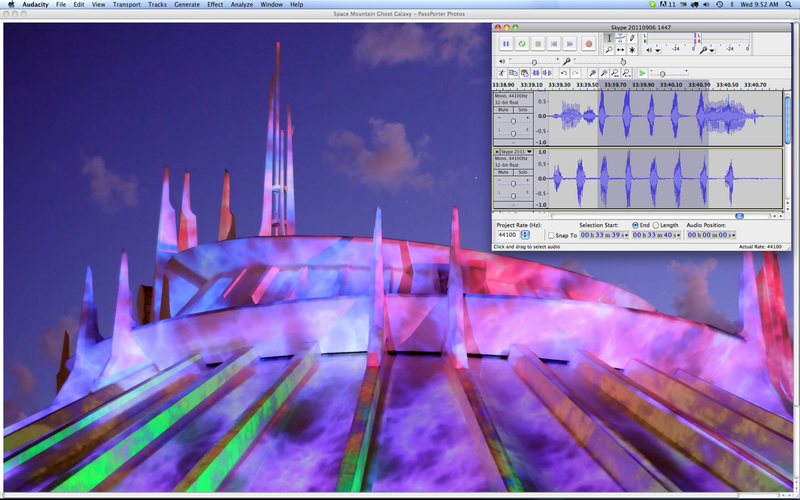 My previous job had a long drive attached to it, and gave me a good chance to listen to Disney podcasts. Of course, my favorite is the PassPorter Moms Podcast, with our very own Jennifer Marx and Sara Varney, and occasional appearances from yours truly! Another one I can thoroughly recommend is the WDW Radio podcast with Lou Mongello. The reason I love it is that it takes you through Disney in amazing detail, giving you some wonderful background stories about what the Imagineers intended for particular areas of the parks, rides, restaurants, and resorts. I’ve certainly learned plenty from listening to it over the last couple of years. Then there are the Disney TV channels, which offer a wide range of Disney viewing, from TV shows to classic movies. If you don’t have access to a TV channel, you must have a Disney DVD or Blu-Ray somewhere in your collection, and if not, there’s never been a better reason to go out and buy one! Sometimes there’s nothing better than settling down to watch one of the Disney classics, and reliving some great memories. 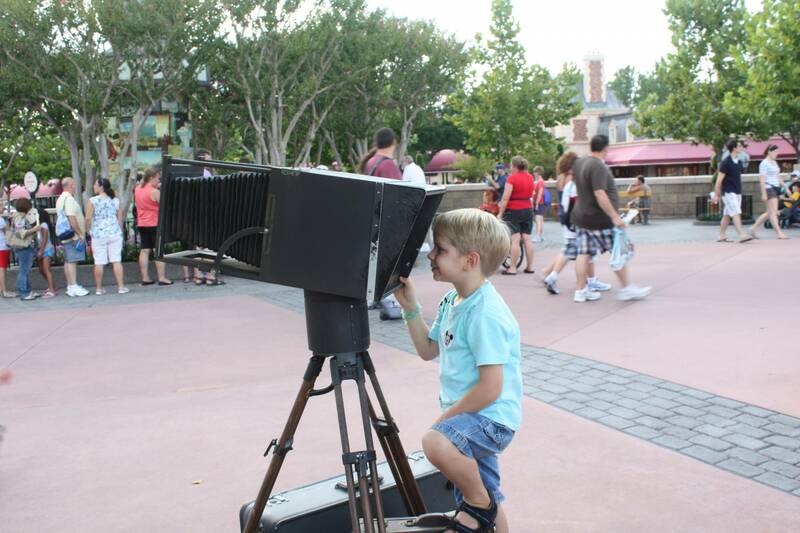 Maybe one day, he'll be a Photopass photographer, n'est pas? Don’t forget that you can find some Disney magic in your local shopping mall, provided you’re lucky enough to live near to a Disney Store. I know that, in the States, that’s become increasingly hard in recent years, with a number closing in recent years, but we are fortunate enough to have one just 20 minutes’ drive from our home. It does make a huge difference, particularly if you’re on a "Disney downer," and I'm sure we've all experienced times like that before! There’s something really uplifting about being able to go and browse the shop, and enjoy a touch of Disney, even if you don't actually buy anything! It’s also fascinating to see the new brand of Disney Stores, with added magic touches, which are appearing all over the place now. Don’t despair if you don’t have a Disney Store nearby. I never cease to be amazed by all the stores over here that have Disney merchandise. Sometimes just catching sight of a Disney character in an unusual place is enough to bring a huge smile to my face, so keep your eyes peeled. You never know where you might find them! My most unusual sighting in recent months was in Belgium, where I found a Winnie the Pooh birthday card in Flemish. Now how neat is that? By the time you've done all of that, you may find that suddenly you're a lot closer to your next Disney vacation than you'd have thought.